Bears RB Matt Forte is still the NFL's leading rusher with 507 yards on the season. For most of their Week 6 matchup, the Detroit Lions’ defense was able to contain Chicago Bears running back Matt Forte. He carried the ball 24 times but gained only 69 yards for a season-low average of 2.9 yards per carry. Although the Lions effectively bottled up Forte (his longest carry was only 11 yards), he still managed to maintain his position atop the NFL’s list of leading rushers. Forte has 507 yards on the season, two more than the player in second place — Atlanta’s Devonta Freeman. Forte and Freeman are the only backs with more than 500 rushing yards through six weeks. 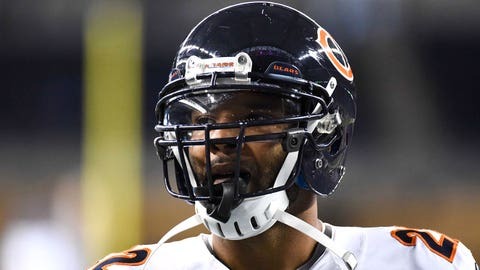 Forte racks up his yardage as the result of a heavy workload. He leads the league in rushing attempts (126) by more than 20 carries. The Bears also employ him as a pass-catcher quite often, as the versatile back has racked up 21 receptions for 191 yards this season. For all those touches, however, Forte only has three total touchdowns this season (two rushing, one receiving). By comparison, Freeman has nine rushing touchdowns and one receiving touchdown for a total of 10 scores in 2015.